I have another recycled can project to share. What's better than more storage space? Cute storage space!! A few years ago, my daughter's class had a fund raising breakfast. To decorate the table, I went to local pizza restaurants and asked them to save all the big metal cans that the tomatoes came in. The cans were perfect for flower arrangements as centerpieces. Click here if you'd like to see that post. 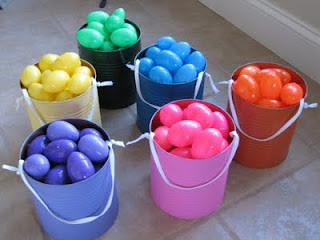 I also used the same cans for our color coded family Easter egg hunt...no fighting over eggs. Click here for that post. Well, I wanted some extra storage in my craft room and needed 6 of something to fit the shelf. You know when you buy multiples of anything, it gets costly. This is where recycling comes in. I also had extra vinyl left over from my sewing table post last week. I purchased the vinyl at Walmart. Measure the vinyl to fit the can. Cut along a mark on the design to keep your cutting straight. Watch for a certain design pattern that you might want in the center of the can. You could probably glue it, but tape worked for me. Fast and easy. These are the big metal cans...about 7 inches high and 6 inches across, so lots will fit in there...fabric scraps, quilt squares already cut to a certain size, buttons, craft supplies, yarn etc. Six cans fit perfectly across the shelf! Ok ladies, start making the rounds to your local pizza or Italian restaurants...those cans are waiting for you. You have a fabulous storage unit!! Very cute idea. I love how it all matches. Where do you purchase this beautiful vinyl? Hi Sue, There wasn't an email address on your google+ account, so I couldn't respond. I purchased the vinyl at Walmart in the sewing /craft section. Karen, the cans look great! I would be just like you and match the patterns. I think they look perfect on your shelf. Love it. So simple yet brilliant! So glad I have your blog in my life!! I completely agree, Heather! This blog is my favorite!! These are beautiful! You amaze me, Karen!!! 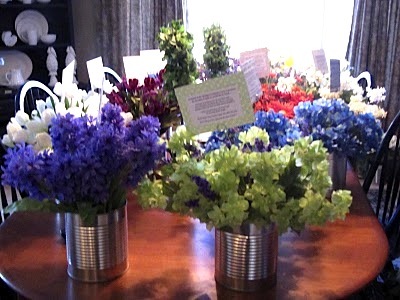 They look perfect on that shelf, and what a great idea for inexpensive center pieces for parties! I just emptied a couple of cans a couple of weeks ago. Now I am anxious to see if I chucked them or kept them. So clever you are! Love your "stuff!" I love that you take garbage and make it look like a million dollars. Keeping all that fun stuff out of the landfills is a wonderful thing. What a gift you have and I am so glad you share it with the rest of us. I have done this project as well, only I use scrapbook paper instead! The possibilities are endless! Super easy to glue to the back of the can so that no tape or anything shows. Very cute and I love your pattern on the vinyl! Not OCD at all - beautiful. The devil's in the details! A coordinated look sure adds to anyone's organization--you are Queen of the fast and simple. #10 cans are a great size. Lucky me....guess who's son works at a pizza shop. I am going to call him right now and ask him to save them for me! Thanks for the inspiration. Love this..I did this years ago with cardboard ice cream containers. Works great...you can even use left over fabric and spray starch or glue. Love this idea. I saw this under the BlogHer Ads text area. Love it! Where did you get the shelves?? I want! I'm trying to copy your room. What department in Walmart did you find the vinyl that you used on the cans? Love your room.